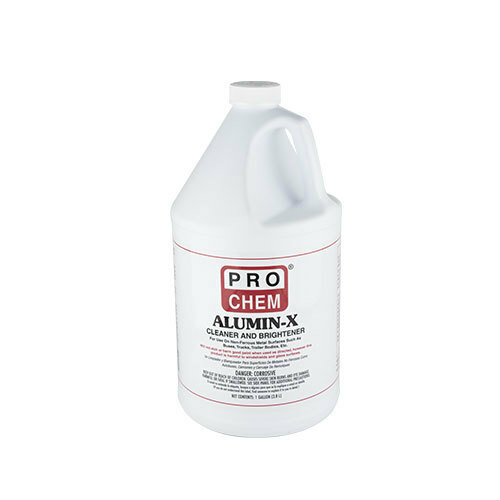 Alumin-X | Pro Chem, Inc.
ALUMIN-X is a concentrated acid-solvent detergent compound especially designed for those problem cleaning jobs that regular alkali cleaners cannot handle. It will not etch or harm good paint when used as directed; however, this product is harmful to windshields and glass surfaces. Do not allow ALUMIN-X to dry on surface, as rinsing is very difficult when dry. It is extremely versatile and may be used in a pressure washer or with a hand held sprayer using hot or cold water. Mix 1 part ALUMIN-X with 30 to 40 parts water, depending on condition of surface to be cleaned. Apply with spray nozzle pressure or fiber brush. Apply liquid directly to surface area working always from bottom to top on vertical surfaces to prevent streaking. ALLOW TO SIT 3 MINUTES FOR COMPLETE ACTION. Rinse with hose or brush, flushing thoroughly with clear water until all suds are gone and no chemical is left on surface. Be sure surface is rinsed well before chemical dries.